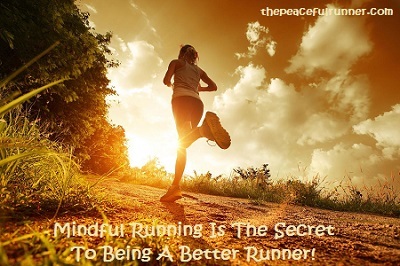 Mindful Running can make you a better runner. 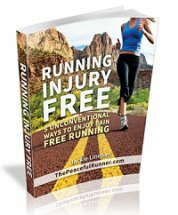 It is becoming more and more popular among runners everywhere. They realize that running harder and training harder isn't the answer. Running should be effortless and enjoyable. Your running can become effortless too. Just remember that it's a skill, so practice running mindfully until it becomes your new habit. Running mindfully means being in the present moment while running. Being in the Present Moment is concentrating only on what you are doing at exactly this moment. Each step, each breath, and each heartbeat can be your focus. This is where you exist and is where your focus should be. If you are someone who lives his or her life in the present moment, you cannot be unhappy. Each task has your full focus and you accept each moment as it is without judgment. You don't worry about what might happen because it doesn't exist in this moment. You plan for the future, but you don't live there. People who live this way are believed to have obtained Satori - the spiritual goal of Buddhism. Practice this skill to improve your running. It will help you stay positive and remove fear and anxiety. You will be calm and relaxed. You will be more focused with increased body awareness. Running outdoors can help us run mindfully and focus on the Present Moment as it gives us the opportunity to enjoy and appreciate the beauty of nature. Start with your breath. Place all your attention on your breath. Concentrate on breathing in and breathing out. Notice the parts of your body that you can feel your breath. Try to run in step with your breath. Try two steps for each inhalation and two steps for each exhalation. The breath connects body and mind where optimal energy is achieved. Then begin to focus on your inner body awareness and allow the positive energy to flow. You will become aware of your body and each movement. How is it moving? Do you need to make slight corrections to move effortlessly? Maybe you will notice tension in an area that you can consciously relax. You will be directed to correct your form. Your efficiency will be increased, but you remain in the Present Moment. Begin to monitor the amount of effort that you feel is required to continue running. Notice what happens if you use less effort. Can you still maintain the same pace? 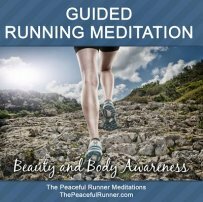 With mindful running, you are totally aware and present to each moment and each step of your run. You are not thinking about dinner or what happened during breakfast this morning. Your total awareness is in this moment and you are enjoying each moment. You are running mindfully. You are not running harder - you are running softer. You are running softly and silently. Your feet are not making any noise as they touch the ground. You breathe quietly. People cannot hear you when you come up from behind. Be careful that you don't scare them as you glide by! This is what you want to achieve. You want to be a silent, peaceful runner. Calm, relaxed, positive and free from fear and anxiety. Running effortlessly with the body and mind in total awareness in the Present Moment. 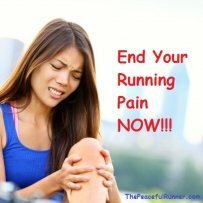 Practice mindfulness, run mindfully and stay pain and injury free. To improve your relationship with food and increase your awareness while eating, try Mindful Eating.